Give a weed a bare spot in a lawn, and she will make it her kingdom.This particular spot suffered too many scuffs of heavy heels, too many digs with paws, maybe even a sprinkler that missed its mark, and the lawn was forced to retreat to safer territory. 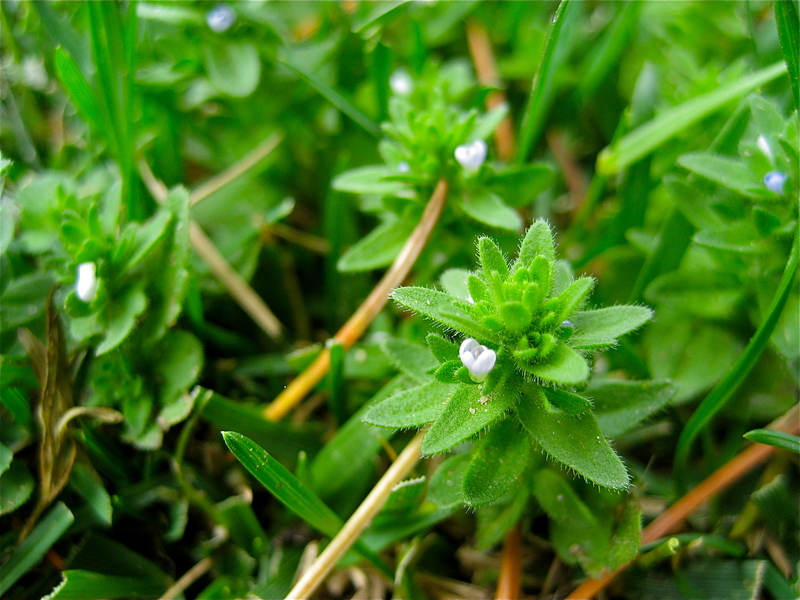 It was a setback for the lawn, but it gave the weeds an edge in the turf war between the two: Lawn vs. Weeds. The weeds always saw the contradiction in the status of the lawn: as plentiful and revered as lawns are, they need to be babied with regular water, food, mowing, so according to weed logic their position is not impenetrable to challengers! The weeds saw the pampering and wanted to get in on the action, maybe change the game up a little! This little princess weed is not quite two inches high and she regally blooms in between mows. She is surrounded by the straight blades of grass that claim such vast territory, but she outclasses them with ease. The ordinary grasses, when seen up close, have very little to offer. In contrast, this princess weed and her surrounding royal court take full advantage of their position and proudly pose while the princess shows off her dewy ivory jewel to all in her domain. You’ve got game, Princess Weed of the Lawn!